I made a real find today. Skippy and I wandered into an area of the woods where we don't usually go and came across a nice stand of Showy Lady's Slipper Orchids (Cypripedium Reginae). I have never seen these before and am mostly guessing that this is what they are as the leaves look like pink lady's slippers, which are fairly common here. 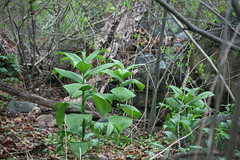 The difference is that the plants I found are MUCH taller - 2 to 3 feet tall. 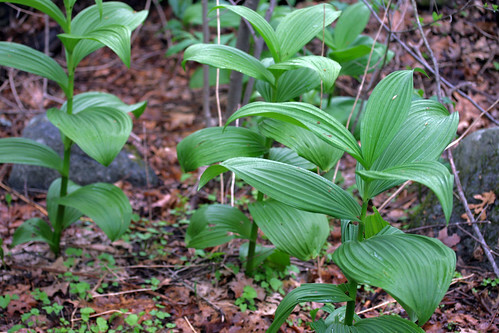 I looked up photos of the showy lady slipper and they look like the plants I found. They are native from Newfoundland to Manitoba, in the northeastern and north central U.S. and in the Appalachians southward and stand 35 to 90 cm (1 to 3 feet) high topped by gorgeous pink-and-white flowers. In most of its US range, this plant is considered rare, endangered or critically endangered. One of the plants has a bud and I am looking forward to seeing the blossom! I will have to check back regularly so I don't miss it. I read that they usually bloom in June, but it looks like this one may bloom sooner than that. 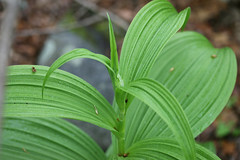 Note added: Thanks for the comment that this plant is actually Veratrum! Ooops. Its a very poisonous plant used for many medicinal preparations with a fairly plain white flower plume. I will have to keep searching for a showy lady slipper. Oh I do hope you capture a picture of it when it blooms! Love the foilage. Nice find! I have seen quite a few wild orchids in northern ontario but nothing here in southern ontario. The woods are so fractured here I'm surprised any native plants are left. Wow! Such an amazing find!! I can't wait to see it when it blooms!! I think that might be Veratrum. Thanks anonymous! The leaves of the showy lady's slipper and veratrum do look kind of similar, but the Veratrum has veins that all collect at the tip - and its much less exciting, so that's what it is! Thanks.